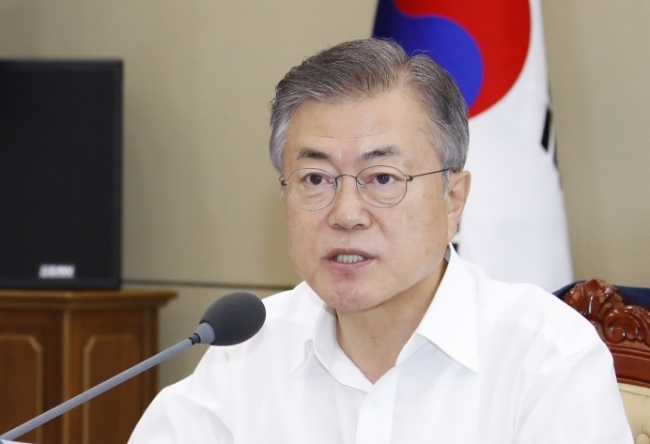 President Moon Jae-in on Thursday called for all-out efforts to minimize damage from an approaching typhoon and measures to ensure the safety of separated families from the two Koreas set to hold their first reunions this week. "I feel burdened hearing the news of the damage on Jeju Island. The government must fully utilize its crisis management capabilities over the next two days when the typhoon will pass through and minimize damage inflicted on the people," Moon said. His remarks came in a visit to the crisis management center, set up at the National Security Office of the presidential office Cheong Wa Dae. Moon's visit came two days after he ordered the presidential National Security Council to open a 24-hour crisis management center. Typhoon Soulik, the 19th this year, struck the southern island of Jeju overnight and was expected to make landfall on the Korean Peninsula early Friday. The president called for efforts to ensure the safety of South Koreans scheduled to visit North Korea's Mount Kumgang for a reunion with their separated families from North Korea. "The typhoon is expected to pass through the Mount Kumgang area where the second round of family reunions will be held," Moon said, according to Cheong Wa Dae spokesman Kim Eui-kyeom. "Please pay special attention to their safety as there are many elders in the group. Also consider (a change) of venue, schedule and conditions if necessary," the president was quoted as saying. Prime Minister Lee Nak-yon issued an emergency order to the finance and interior ministers, citing the need to dispel uneasiness over children's safety. "Public servants and officials at local governments and public institutions are advised to actively take a day or half a day off Friday in the case that they have children who will not go to school due to the typhoon," Lee said. He also urged private companies to encourage their workers to take a day off or work flexibly if needed. Meanwhile, an official at the unification ministry said that at this point in time, the two Koreas plan to hold the second round of family reunions this week as planned. "The two Koreas are preparing for the event at Mount Kumgang according to the (original) plan," the official said on condition of anonymity. "We are making all necessary preparations, including the safety management and facility checkups." Later in the day, the ministry said that it is preparing measures to ensure the safety and health of participants during the planned reunions. "While monitoring the situation related to the typhoon, we are preparing even for the possibility of the reunion schedule being adjusted, if necessary, in consultation with the North," the ministry said in a statement. The second round of family reunions is scheduled to be held Friday and Saturday. It follows the first round, also held at Mount Kumgang, from Monday-Wednesday. Seoul has ordered a temporary closure of public schools in the capital and several other areas as the typhoon will mark the first of its kind to make landfall on South Korea in six years.